The existence of the Holocaust goes on trial in Mick Jackson’s straightforward but well-acted docudrama about a 2000 British court case. A well-known British Holocaust denier, David Irving (Timothy Spall), sues an American history professor, Deborah Lipstadt (Rachel Weisz), for libel after she avers his claims are wrong in her book. This prompts a lawsuit, where under British law, the accused must prove her case, which here rests on the broader question of whether the Holocaust actually occurred. Lipstadt’s legal eagle is the somewhat plodding Richard Rampton (Tom Wilkinson), who initially seems primarily bemused by the case. 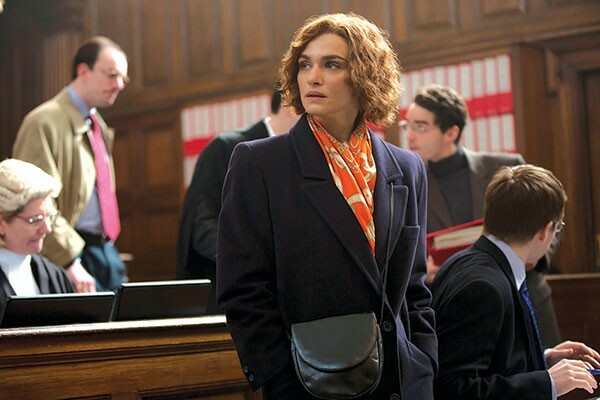 Denial is of note for those interested in the peculiarities of the British legal system, and the film’s essential argument is remarkably timely given our increasingly post-truth election season. Irving holds a lie to be a truth and has built his reputation on it. That can be a devilish thing to undo both within the legal system and in the court of public opinion.